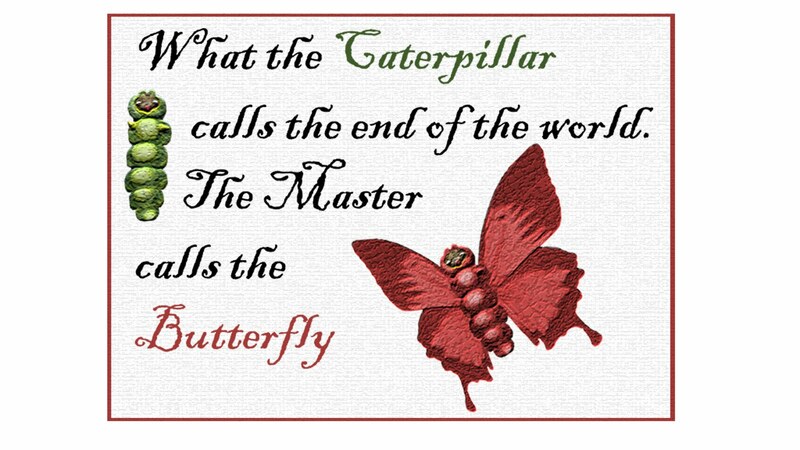 Victoria's interactive media experience: What the caterpillar calls the end of the world- The master calls the butterfly. What the caterpillar calls the end of the world- The master calls the butterfly. I am handing in my last project EVER at college tommorow afternoon. Whilst I was finishing up my notes and evaluation, I remebered a stop motion animation I had watched on shortsTV called butterfly. At the end of that animation there was a quote that I didnt get until now. "What the Caterpillar Calls the end of the world, The Master calls the Butterfly"
This quote is about metamorphasis.